01/10/15 – Added scan of 1984 released edition. Long before Chris Abbott was busy creating some of the biggest C64 music events in history with stars such as Ben Daglish, Rob Hubbard, Martin Galway, David Whittaker and many many other big names.. Chris was busy trying to break into the C64 industry by creating game music. Chess was one title which Chris had offered to him for him to compose the game’s music. All of this he did, with slight variations which can be found in the HVSC based download. However, the game for reasons currently unknown, got cancelled and was never seen or heard of again. Hopefully Chris will shed some more light on this soon. What is very strange is that the Chess game was planned for 1984 release, whilst Chris’ music was composed in 1988. So is there a possibility that Chris was doing music for a new updated version. We’re not sure. The 1984 version was created by David Thompson, who created a Draughts game which was released in the same year. In the scans is a copy of the 1984 edition, thanks to Sean O’Neill for flagging up. 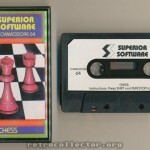 I had the chance of meeting a representative of Superior Software while at Croydon this year (2004), and asked about the Chess game, but no details of the game were passed. Superior are very protective of their old code, so its unlikely that if any code existed with them, that they’d ever let it out here.